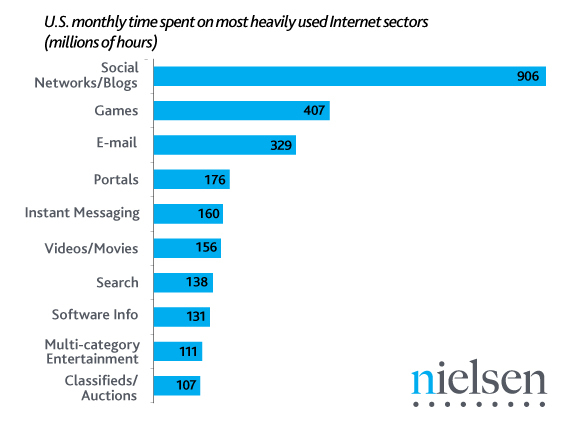 The big news in my RSS reader this morning was the Nielsen Report that Internet users, more specifically American ones, prefer online gaming and socializing to e-mail. Some of the headlines regarding this news called for a crackdown by American businesses to protect their bottom line from employees abusing the Internet. This has merit to a certain degree, but this is much more related to organizational culture than anything. Rather, I’d say forward-thinking organizations should leverage the fact that individuals are using more complex and social media and use it to their advantage. With so many adopters, there really is no excuse for organizations to resist using technology as a means for enhancing learning and development.